Click Register Now and follow the prompts to register. Requirements: Must have a high school diploma or GED; Must be 18 years of age. 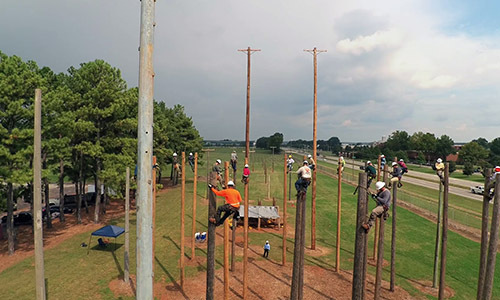 Calhoun Community College’s Pre-Apprentice Lineworker Program was structured with input from the Tennessee Valley Public Power Association (TVPPA) Apprentice program, regional and statewide utilities, cooperatives, and electric contractors along with best practices from other lineworker training programs. This program is offered regionally and is based on industry need and demand. Cost: The fee for the program is $3990. If you think you are eligible for state funding through WIOA or Youth Programs, you should visit your local Alabama Career Center. A forty hour, Pre-Apprentice Lineworker CDL Training and Testing program is available for students holding a learner’s permit, seeking to obtain a Class A or Class B license, who are enrolled in the Calhoun Community College Pre-Apprentice Lineworker course. Note: The DOT physical, drug screen and motor vehicle report (MVR) must be dated within 30 days of the first scheduled class day. In the event the lineworker student has completed a DOT physical and received a medical card previously, please make sure that the expiration date is valid. The training includes hands-on instruction in the pre-trip inspection, backing exercises, and the road test. The lineworker student must submit a copy of the required documentation below at on the first day of the Lineworker course. If the lineworker student has an out-of-state learner’s permit, they may attend training and participate in skills testing at Calhoun Community College.